In a strict sense, the term “optic nerve” is not correct, since the optic nerve is part of the central nervous system and is not similar to a peripheral nerve or other cranial nerves, such as the trigeminal nerve. As part of the central nervous system, the optic nerve is surrounded by the meninges and surrounded by cerebrospinal fluid (CSF). Since the optic nerve as a cerebral neural fascicle leaves the intracranial space, the CSF space extends from the intracranial compartment through the tiny optic canal into the orbit and ends anteriorly at the back of the globe. The tissue pressure in the orbital part of the optic nerve is therefore not equal to the tissue pressure in the orbit (about 2 mmHg [1, 2]) but is at least as high as the pressure in the orbital CSF space or the orbital CSF pressure (CSFP) (; Bellezza et al. 2000; [4–15]). These anatomic relationships may be of profound importance for the physiology and pathophysiology of the optic nerve head (optic disc), which acts as the pressure barrier between the intraocular compartment and the retrobulbar compartment. 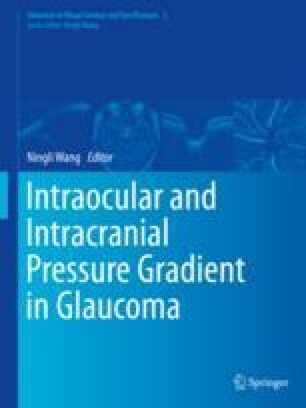 The text and figures of this manuscript have appeared previously in a Progress in Retinal and Eye Research review of our work: Jonas JB, Wang N, Yang D, Ritch R, Panda-Jonas S. Facts and myths of cerebrospinal fluid pressure for the physiology of the eye. Prog Retin Eye Res. 2015;46:67–83 . They have been used with permission and edited for this chapter.